Kamo Seiko - Techmaster Inc.
Kamo Seiko has Zero backlash right angle and pancake speed reducers. 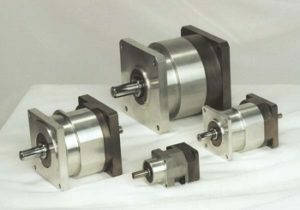 Multiple stop miniature indexers. 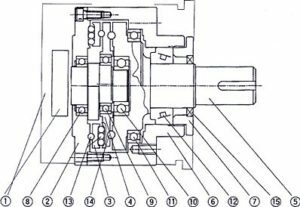 Maximum peak torque The allowable peak torque applied to the output shaft when normally started from a stop or normally stopped from a running mode. The allowable maximum instantaneous torque applied to the output shaft when the load is emergency stopped or subjected to an external impact. Note: Care should be taken that the maximum transition torque not be exceeded during normal operation. NOTE: ALL SPECIFICATIONS ARE IN ENGLISH UNITS UNLESS OTHERWISE NOTED. CALL FOR RATIOS NOT LISTED PER MODEL. The Kamo Seiko MINITABLE is a precise indexing table featuring extremely high positioning accuracy in a very compact and robust package. The table rotation is uniform, with rotating torque being proportional to air pressure applied. A simple four-way valve arrangement allows the MINITABLE to be installed easily with a wide range of applications in mind. Due to the locking pin mechanism utilized, the MINITABLE provides holding torque and accuracy compatible with its performance. 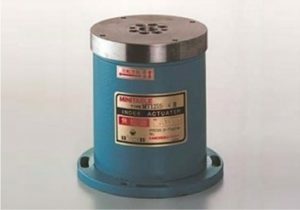 With either base mounting or flange mounting available as standard, the MINITABLE can be mounted in various orientations without sacrificing performance. Note: Indexing torque must be reduced by 40% of rated torque in models with two (2) index stops. Note: Rotation shown by arrow is left. When designing, observe the mounting hole position as reference to index start mark. MT (70, 100, 125, 200), (S, F), (NUMBER OF INDEXES), (R, L) Example: MT70-S-4 – R is defined as a Model MT70 with a Standard mount, 4 stops and rotating to the Right when viewed from the top. When designing the MINITABLE into an application, the load inertia, JL should be within the specified values. There is a correlation between indexing time and load inertia so care should be taken when determining the MINITABLE model and the indexing time to inertia load relationship. The indexing time listed in the specifications is a no load time. The index time for a load of maximum JL is set for 3 seconds. 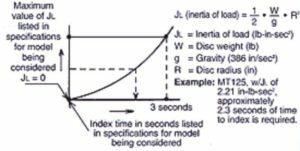 Calculated values of JL should be proportionally distributed between the no load index time and the 3 second maximum load time. In order to maintain long-term reliability in the MINITABLE selected, it is advised that the units be operated within the area shown in the charts below. The Kamo Seiko MINIDEX is an extremely small intermittent motion pneumatically driven actuator. 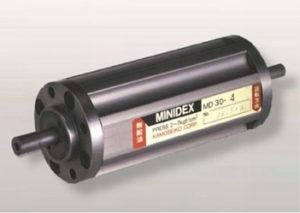 The MINIDEX offers double ended output shafts that are incorporated in a manner that allows the use of an integrated pneumatic drive with both indexing and positioning capability as standard. Stop positions of the MINIDEX are exact with the use of internal locking pins and contribute to accuracy of positioning and repeatability without overrunning or external stops. The compact cylindrical form factor of the MINIDEX allows for installation in limited space without sacrificing performance or accuracy. 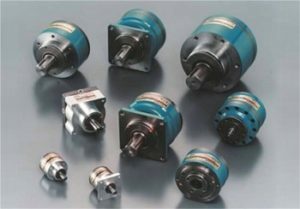 Available in various stop locations per revolution of output shaft, the MINIDEX is a versatile device unmatched by another device of its size. One complete index of the MINIDEX is achieved with a compound movement as illustrated below. Note: Dimensions in ( ) for MD75 are for models with 6 stops or more. Example: MD30-4 is defined as a Model MD30 with 4 stops per revolution. When designing the MINIDEX into an application, the load inertia, JL should be within the specified values. There is a correlation between indexing time and load inertia so care should be taken in determining the MINIDEX model and the indexing time to load inertia relationship.